Araştırma Topluluğu Modeli çevrimiçi ya da harmanlanmış öğrenme ortamlarında bilginin ve anlamın inşaası için gereken işlem ve davranışları, bilişsel, toplumsal ve öğretimsel buradalık arasındaki ilişkinin gelişimiyle açıklamaktadır. Bu üç öge arasındaki dinamik ilişki, pek çok araştırmacı tarafından doğrulansa da bazı araştırmacılar toplumsal buradalığın bilişsel buradalık üzerindeki etkisinin anlamlı olmadığını öne sürmekte ve modeli eleştirmektedir. Modele yöneltilen eleştirileri tartışmak üzere planlanan bu çalışmanın amacı, araştırma topluluğu modeline göre oluşturulan Facebook gruplarındaki toplumsal ve öğretimsel buradalık algısının bilişsel buradalık algısını yordayıp yordamadığını incelemektir. Çalışma yarı deneysel desende yürütülmüş ve çalışmada Araştırma Topluluğu Ölçeği kullanılmıştır. Veriler çoklu regresyon analizi ile incelenmiştir. Analiz sonuçları toplumsal ve öğretimsel buradalığın, bilişsel buradalığı anlamlı olarak yordadığı ve toplumsal buradalığın bilişsel buradalıkta oluşan varyansın oldukça önemli bir bölümünü açıkladığını göstermiştir. Community of Inquiry Model defines operations and behaviors required for the construction of knowledge and meaning in online or blended learning environments according to the development of cognitive, social and teaching presence structures. Even though the dynamic relationship between these three factors was verified by many researchers, some others criticized the model suggesting that the effect of social presence on cognitive presence was insignificant. The purpose of this study, which was designed to discuss the criticisms directed to the model, is to explore whether social and teaching presence in the Facebook groups that were formed in accordance with the community of inquiry model predict cognitive presence or not. The study was conducted with a semi-experimental design.Data were obtained according to the Community of Inquiry Scale. Regression analysis was employed in the analysis of data. The analytical results indicated that social and teaching presence were significant predictors of cognitive presence, and social presence explained the majority of variance in cognitive presence. Akyol, Z., & Garrison, D. R. (2008). The development of a community of inquiry over time in an online course: Understanding the progression and integration of social, cognitive and teaching presence. Journal of Asynchronous Learning Networks, 12(2-3), 3-23. Akyol, Z., & Garrison, D. R. (2011). Assessing metacognition in an online community of inquiry. Internet & Higher Education, 14(3), 183-190. Akyol, Z., & Garrison, D. R. (2014). The development of a community of inquiry over time in an online course: Understanding the progression and integration of social, cognitive and teaching presence. Journal of Asynchronous Learning Networks, 12(3–4), 3–22. Akyol, Z., Garrison, D. R., & Ozden, M. Y. (2009). Online and blended communities of inquiry: Exploring the developmental and perceptional differences. The International Review of Research in Open and Distance Learning, 10(6), 65–83. Anderson, T., Rourke, L., Garrison, D. R., & Archer, W. (2001). Assessing teaching presen-ce in a computer conferencing context. Journal of Asynchronous Learning Networks, 5(2), 1- 17. Annand, D. (2011). Social presence within the community of inquiry framework. The International Review of Research in Open and Distributed Learning. 12, (5), 50-56. Aragon, S. R. (2003). Creating social presence in online environments. New Directions for Adult and Continuing Education, 100, 57- 68. Arbaugh, J.B., Cleveland-Innes, M., Diaz, S.R., Garrison, D.R., Ice, P., Richardson, J.C., & Swan, K.P. (2008). Developing a community of inquiry instrument: Testing a measure of the Community of Inquiry framework using a multi-institutional sample. The Inter-net and Higher Education. 11 (3-4), 133-136. Archibald, D. (2010). Fostering the development of cognitive presence: Initial findings using the community of inquiry survey instrument. The Internet and Higher Educa-tion, 13(1-2), 73–74. Büyüköztürk, Ş., Kılıç Çakmak, E., Akgün, Ö. E., Karadeniz, Ş. ve Demirel, F. (2012). Bi-limsel araştırma yöntemleri (13.Baskı), Ankara: Pegem Akademi Yayınları. Garrison, D. R., & Akyol, Z. (2013). The Community of Inquiry Theoretical Framework. In M. G. Moore (Ed. 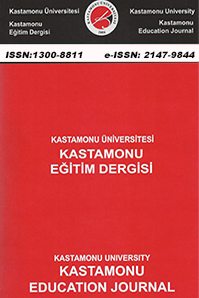 ), Handbook of distance education (pp. 104–119). New York, NY: Ro-utledge. Garrison, D. R., & Arbaugh, J. B. (2007). Researching the community of inquiry fra-mework: review, issues, and future directions. The Internet and Higher Education, 10(3), 157–172. Garrison, D. R., Anderson, T., & Archer, W. (2000). Critical inquiry in a text-based envi-ronment: Computer conferencing in higher educationmodel. The Internet and Higher Education, 2(2-3), 87-105. Garrison, D. R., Cleveland-Innes, M., & Fung, T. -S. (2010). Exploring causal relations-hips among teaching, cognitive and social presence: Student perceptions of the com-munity of inquiry framework. The Internet and Higher Education, 13, 31–36. Garrison, D.R., Anderson, T., & Archer, W. (2001). Critical thinking, cognitive presence, and computer conferencing in distance education. American Journal of Distance Edu-cation, 15(1), 7-23. Gunawardena, C. N., Lowe, C. A., & Anderson, T. (1997). Analysis of a global online deba-te and the development of an interaction analysis model for examining social construc-tion of knowledge in computer conferencing. Journal of Educational Computing Rese-arch, 17(4), 397–431. Jocsimovic, S., Gasevic, D., Kovanovic, V., Riecke, B. E., & Hatala, M.(2015). Journal of Computer Assisted Learning, Volume 31, Issue 6, , Pages 638–654. Kozan, K., & Richardson, J. C. (2014). Interrelationships between and among social, teaching, and cognitive presence. The Internet and Higher Education, 21, 68-73. Lowenthal, P. R. (2009). The evolution and influence of social presence theory on online learning. In T. T. Kidd (Ed. ), Online education and adult learning: New frontiers for teaching practices (pp. 124-139). Öztürk, E. (2012). Araştırma topluluğu ölçeğinin Türkçe’ye uyarlanması: Geçerlik ve güvenirlik çalışması. İlköğretim Online, 11(2), 408–422. Picciano A.G. (2002) Beyond Student Perceptions: Issues of interaction, presence, and performance in an online course, Journal of Asynchronous Learning Networks, 6(1), 21–40. Rourke L., Anderson T., Garrison D.R. & Archer W. (1999) Assessing Social Presence in Asynchronous Text-based Computer Conferencing, Journal of Distance Education, 14(2), 50–71. Rourke, L., Anderson, T., Garrison, D. R., & Archer, W. (2001). Assessing social presence in asynchronous text-based computer conferencing. Journal of Distance Education, 14(2), 50–71. Shea, P. (2006). A study of students’ sense of learning community in online environ-ments. Journal of Asynchronous Learning Networks, 10(1), 35–44. Shea, P., & Bidjerano, T. (2008). Measures of quality in online education: An investiga-tion of the community of inquiry model and the net generation. Journal of Educatio-nal Computing Research, 39(4), 339–361. Shea, P., & Bidjerano, T. (2009). Cognitive presence and online learner engagement: A cluster analysis of the community of inquiry framework. Journal of Computing in Hig-her Education, 21, 199–217. Shea, P., & Bidjerano, T. (2010). Learning presence: Towards a theory of self-efficacy, self-regulation, and the development of a communities of inquiry in online and blen-ded learning environments. Computers & Education, 55(4), 1721–1731. Swan, K., Shea, P., Richardson, J., Ice, P., Garrison, D. R., Cleveland-Innes, M., & Arbaugh, J. B. (2008). Validating a measurement tool of presence in online communities of inquiry. E-Mentor, 2, 1–12. ISNAD ÖZTÜRK, Ebru , ERDEM, Mukaddes , DERYAKULU, Deniz . "Toplumsal Buradalık ve Öğretimsel Buradalığın Bilişsel Buradalığı Yordama Gücü". Kastamonu Eğitim Dergisi 25 / 4 (July 2017): 1319-1336.